The death of 81-year-old Anant Pai, in Mumbai, India, on 24 February 2011, was widely reported in the Indian news media (such as The Hindu newspaper), as well as international publications, including the online editions of the New York Times and The Washington Post. Although his name may be unfamiliar to many Western comic-book audience, ‘Uncle Pai’ (as he was known to generations of Indian children) occupies a significant place in the history of Indian comic-books, akin to that held by Osamu Tezuka in Japan, or Stan Lee in the United States, and is widely credited with launching India’s comic-book industry in the 1960s. ‘In February 1967, my wife and I were visiting Delhi, and stopped [at a bookstore where] the TV was on … and the program was a quiz featuring five students from St. Stephen’s College. When they were asked, the students could not name the mother of Lord Ram. I was disappointed, but I thought, well, that is from a long time ago. But then a question came about the Greek gods on Mt. Olympus, and the children could answer that question! This is the trouble with our education system: children are getting alienated from their own culture’ (Pai, quoted in McLain, 2009: 24). However, soon after Pai’s death, a story appeared in OutlookIndia.com, which reported that it was a Bangalore book salesman, G.K. Ananthram, who originally persuaded the owner of India Book House (which previously specialised in importing English-language novels) to publish a comic-book series for young readers, printed in Kannada, one of the official ‘scheduled’ languages of India. Like Pai, Ananthram was determined to use comic-books as an educational tool, and recruited the noted Kannada novelist, K. Shivaram Karanth, to translate their first reissues of Classics Illustrated comics (Ananthram also reportedly came up with the series’ title, Amar Chitra Katha). Buoyed by the comics’ initial success, Ananthram submitted a further proposal to India Book House, suggesting the series be expanded and revamped as an English-language title featuring mythological Indian stories; the company took up his suggestion, but turned instead to Anant Pai to develop the project further. While acknowledging that Pai ‘built a wonderful team and a great brand’, Ananthram nonetheless maintained that he saw himself “as a midwife in the birth of the comic series’ (quoted in Srinivasaraju, 2011). Prior to joining India Book House, Anant Pai was working for the Times of India newspaper group, where he was assigned the task of developing a new comic-book magazine, ostensibly to keep the company’s Gravure printing presses running at maximum capacity after the calendar-printing season (Chandra, 2008: 201). 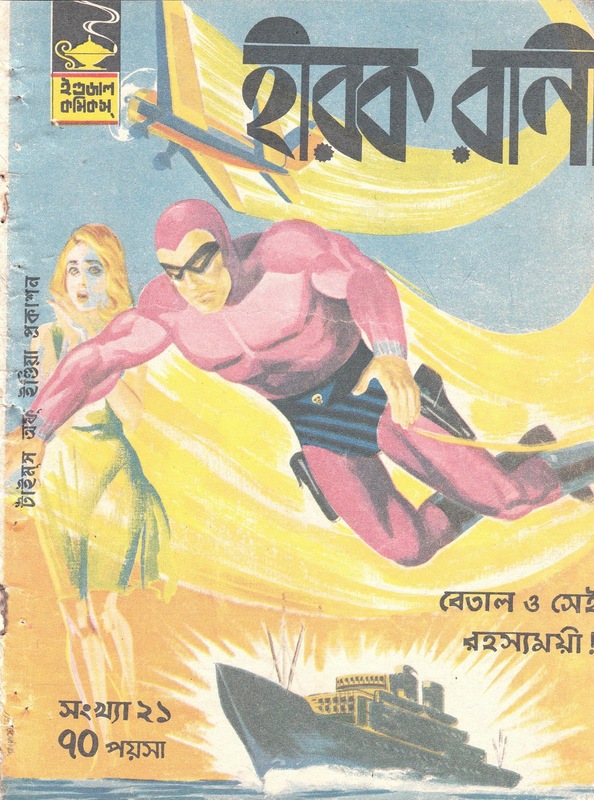 Pai eventually settled on using Lee Falk’s The Phantom as the ‘star’ of the new publication; not only was The Phantom already familiar to middle-class audiences through its serialisation in The Illustrated Weekly of India (also owned by Bennett, Coleman & Co, publishers of the Times of India), but Pai himself reasoned that the character’s wild jungle setting might also resonate with Indian readers (See: Aruna Rao, ‘From Self-Knowledge to Super Heroes: The Story of Indian Comics’, in Illustrating Asia: Comics, Humour Magazines and Picture Books, edited by John A. Lent, University of Hawaii Press, 2001, pp.37-63). The first issue of Indrajal Comics appeared in 1964, featuring ‘The Phantom’s Belt’; Pai had originally planned to feature both foreign comic-strips, and original comic-book content devoted to Indian stories and subjects. However, as Indrajal Comics remained entirely comprised of American comic strips (including Flash Gordon and Mandrake the Magician) throughout the 1960s, Pai left the company and eventually became editor of Amar Chitra Katha at India Book House. The rest, as they say, is history. The ‘story-behind-the-story’ of Amar Chitra Katha is fascinating in itself, and brings to light a remarkable comics-publishing phenomenon which, until a few years ago, went largely unnoticed by Western comic-book historians and academic researchers. For myself, the other intriguing aspect of this story is the pivotal role that The Phantom played in fostering audience demand for comic-books in a country which had no previous tradition of comic-book publishing. Pai’s decision to use The Phantom to launch Indrajal Comics is especially intriguing, touching as it does upon the character’s status an archetypal – rather than overtly American – hero, one capable of transcending cultures and resonating with vastly different international audiences. In one sense, The Phantom does represent a form of cultural imperialism of the kind that Chandra alluded to earlier in this piece; yet in another, paradoxical sense, the popularity of The Phantom (and Indrajal Comics) helped laid the groundwork for a truly ‘Indian’ comic-book industry, which gathered commercial momentum throughout the late 1960s and 1970s, employing writers and illustrators whose work reflected Indian culture, both past and present. The Phantom became an almost ‘accidental’ Indian hero; the decision to cast ‘The Ghost Who Walks’ as the star of Indrajal Comics was driven in part by commercial and technological necessity – to simply keep the printing presses running. But in doing so, The Phantom became the inadvertent midwife to India’s comic-book industry. It may not be too far-fetched to argue that, if it weren’t for The Phantom, there would be no Amar Chitra Katha (Image courtesy of The Return of Indrajal Comics).